A USB memory stick or flash drive represents freedom for many Cubans. 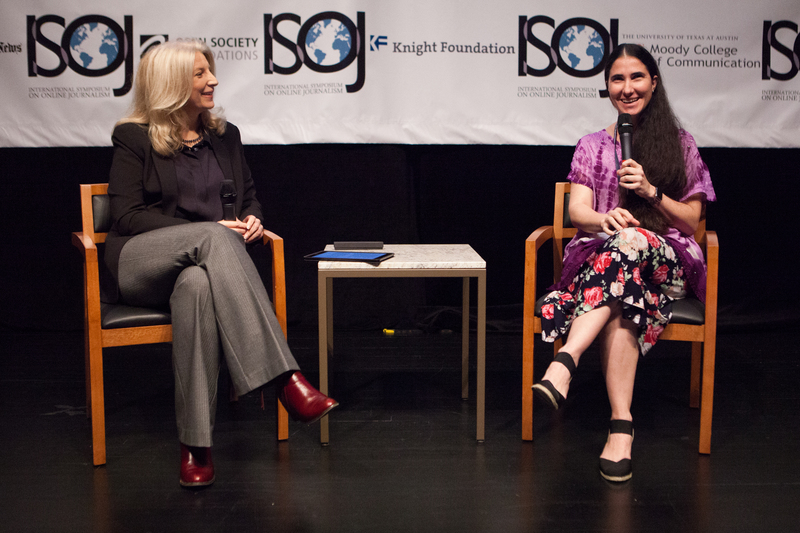 Blogger and journalist Yoani Sánchez stated this during the opening panel on the second day of the 17th International Symposium on Online Journalism (ISOJ). During her presentation, Sánchez explained the challenges for making digital journalism in one of the places “with the least internet connectivity” in the world – about five percent of the population has access, according to Sánchez – and how they have used the available technology and their creativity to overcome these challenges. Information, before USBs were used, was more like rumor. With evolving technology, the way to transmit information has evolved to “real illegal networks,” distributed through flash drives, external hard drives, CDs and other devices. It was in this environment that 14ymedio was born as a digital native media in May 2014, not by choice, but because “it was the only option,” with the assurance that the government would not give them permission to print a newspaper, the journalist said. Another objective was to legalize their situation somehow – to find “cracks” in the law that permitted them to work. In Cuba, journalism is a profession that cannot be held by “self-employed” people (ie. people working privately), Sánchez explained. They found that typing is one of the professions that does not have restrictions. “We decided that our team works under a typist’s license. So that’s what we are: typists that type our own ideas,” Sánchez said with a tone of humor. Her other goal was to offer a variety of information that distances them from the constant “contradiction” that independent media in the country have with the government. Thus, they also offer cultural news, dealing in themes like Cuban exile or prices of common grocery store products. The team passed its “litmus test” last March when, after almost two years of work, they covered two historic events: the visit of President Obama to Cuba and the Rolling Stones’ concert in Cuba. So they have resorted to other strategies not only to publish, but to reach out to the Cuban people. Their most important tool is email as it is one of the few spaces that is allowed by connectivity available on the island. According to Sánchez, most of the information from 14ymedio is distributed by email. But they do not forget those who cannot access the internet. Through flash drives, they deliver an edition of 14ymedio in PDF format that is clandestinely shared on the corners of Havana each week. Now they are even dabbling in reaching out to other cities with the same method. They also reach readers via text messages. Despite the obstacles to producing journalism in Cuba, Sánchez and her team are convinced of the importance of producing journalism which is related with a different future for their country. “So 14ymedio wants to be the newspaper of the Cuban transition. To accompany the citizens of the island in the process that we will inevitably and fortunately live,” she concluded.